I am trying to create a shape designed with 3 circles that will act as the corners. I am placing the circles very precisely so I want to start with them to define the shape. What I need to do now, is create a path connecting and surrounding the circles so I end up with triangles with rounded corners. Is there a way to do this in Illustrator so it can be done automatically so it is most precise? See image for example idea. Yes there's an automatic way with Illustrator CC that doesn't require circles to be drawn at all. 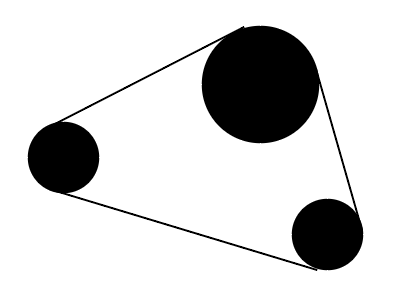 Draw a triangle (or any polygon). Select the Shape with the Selection Tool (V), and switch to the Direct Selection tool (A). Round the corners by clicking and dragging the Rounded Corner widgets. You can adjust all corners at the same time, or adjust each separately by clicking to select only one widget before clicking and dragging. How to create rounded corners on WiFi signal shape in Adobe Illustator? How to create a sine wave with a given angle between the side of the wave? How can I fix Illustrator fill going outside of lines of shape?